It’s a sad truth that many freelance writers start their career by working for content mills–or companies that produce a high volume of content but pay their writers little to nothing. Even I started my writing career at a penny per word. I don’t think there’s any shame in starting at content mills. After all, they can teach you a lot of lessons that you can apply to your full-time freelancing career. But they also have their downsides. They pay next to nothing, and it’s too easy to burn out with them. If you’ve been working for one, then you know exactly what I’m talking about. You love the freedom of freelancing, and you certainly love the writing aspect, but the crap pay and strict guidelines make you want to go back to the 9-5 office. Don’t worry. You don’t have to stick with content mills forever. If you found yourself stuck working for a content mill and want to make more money freelance writing, here are a few ways to advance your freelance writing career. This is where a lot of writers have trouble breaking free of content mills. That’s because marketing your services doesn’t come with direct income until you land your first client; writing for content mills, however, ensures that you’ll get paid, even if it’s only $5 for an hour of work. So if you’re trying to make your rent payment, marketing your services when there’s no guarantee of payment seems a bit like a waste of time. I thought the same thing. I was scared to death of private clients, but it ended up being a lot less terrifying than I thought, and my marketing efforts are paying off. When you decide to take on private clients, it doesn’t have to be an 8-hour per day ordeal. Set aside a half an hour or so per day for marketing purposes. When you’re ready to get started, here are just a few options to help you land private clients. Remember that as a freelancer, you’re a sole proprietor, which means that you technically run a business. You wouldn’t expect any local business to go without a website, would you? So why don’t you have one? A website can earn you traffic through search engines and social media, but it can also serve as a place where clients can learn more about you and make a final decision to hire you. 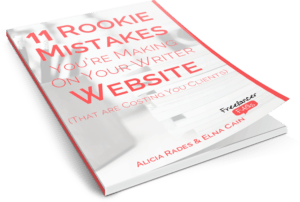 So when you hand out your business card to someone who needs a writer or you get a referral from a friend or a fellow writer, you want somewhere to direct prospects, and your writer website is going to serve that purpose. The good news? It doesn’t have to be a huge investment. You can start with a free website, such as at WordPress.com. My biggest piece of advice? If you’re going with a free website, be sure you at least purchase your own domain name so you don’t have .wordpress in your URL. It will look a lot more professional. But I wouldn’t recommend the free route if you’re going for “professional.” Instead, invest a few dollars per month on a self-hosted WordPress site. I put this in a different category of “website” because I don’t believe that all freelance writer websites need a blog. Some writers don’t have a blog at all. Others have a blog completely separate from their writer website. 57 percent of companies with a blog have acquired customers from their blog. Blogs affect customer buying behavior more than traditional advertising. Small businesses with blogs (you!) generate 126 percent more leads. The idea here is that prospects will find your website/services via your blog content, and you can convert many of them into clients. To make this tactic effective, it’s best to write by targeting your ideal client. For instance, if you want to offer travel brochure writing services, you would probably blog about travel or running a travel agency. A good place to find clients is right in your own community. You can always cold call or send direct mail to local businesses to see if they’re in need of your writing services. It’s also worth simply keeping your business card handy so that when you meet new people within your community, you have a chance at turning them into clients. Other marketing tactics, like running an ad in the newspaper, could be an effective way of landing clients. I add this option to the list because I’m a firm believer that networking is important for your business. However, I do realize that building up a network can take a lot of time and effort and that it likely won’t pay off immediately. Still, I do think it’s worth investing 15 minutes or so per day into if that’s all the time you have. Start at social networks or forums. But don’t stop at just networking with writers. Google+ groups and LinkedIn groups are great places to network with your target clients. Guest blogging can also be a great networking tool, and you can even make money from it (we’ll get to that later in this post). Another great way to move up from content mills is to start applying for higher paying gigs on job boards. If you don’t have a lot of time, then start by applying to just one job per week. The key here is to not waste your time on the low-paying gigs. You especially don’t want to fall for, “We’ll give you a byline and great exposure, but we don’t have the budget to pay our writers right now.” You can get a byline and exposure for pay, and chances are these publications don’t offer the level of exposure you’re looking for. The good news is that there are a good amount of decent paying gigs available on job boards. You just have to have the confidence to apply for them. What are some job boards worth checking out? Unlike marketing your services and hoping that someone will contact you, you’re already in direct contact with a potential client, so it can save you a lot of time. Most of these publications offer a byline, which means you’ll get payment and a clip to add to your portfolio. This can lead to lasting relationships and multiple assignments. But how do you find these publications? Start at blogs. Sophie Lizard has put together a list of 75 blogs that pay (opt-in required). That’s a great resource to start with. Otherwise, you can explore blogs you already frequent and see what their contributor guidelines are like. Likewise, you can look at magazines’ contributor guidelines to see if they pay their contributors. Or, just talk with other freelancers to see what publications they’ve written for that pay. The biggest thing you need when going this route is confidence. A lot of publications won’t care if you have clips or not as long as you have a really good idea, so don’t be afraid to take chances! The good news is that content mills probably won’t be around forever as Google algorithms change. With Google’s updates over the past few years alone, content standards are higher, which means people are willing to pay more for that content. However, the truth is that content mills do still exist, and because they’re easy to get into, a lot of writers start out there and don’t know where to go next. I’m not going to tell you that you can break out of them in a week; it’s not always a fast process. I do believe, however, that it’s possible if you put your mind to it and build up the confidence. Want personalized advice? Leave us a comment, and we’ll help point you in the right direction to make these tips work for you. Your advice is right on target. In the past month, I gained a single private clients, who pays me a base price that is 3.5 times higher that the standard pay from the content provider I work for. This month they ordered three jobs from me, and with another job from another private client, I made half my target income from only four articles, I am now following nearly all the steps you have outlined and already have followers on my site and my blog. Thank you for an encouraging and spirit lifting blog post.